Do you want to learn how to make goals for yourself this month and actually stick to them? Well, luckily there is a proven method to setting goals and accomplishing them. Unfortunately for a lot of people, studies show that most resolutions list do not pan out the way we hope they will. 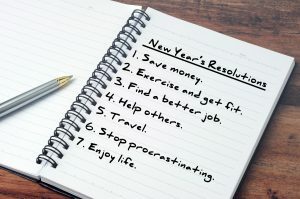 Don’t waste your money on a failed resolution and find a way to set goals that truly work today by reading through our top tips listed below. When it comes to fitness goals, for example, don’t expect to see immediate results. Write down your goals and track your weight as you go along. If you don’t set short term goals for your body, you will rush into creating a workout routine and eventually burn out. Slow and steady wins the race, right? Make the effort to set small, reachable goals at the start of the year. If you plan on losing 5-10 pounds in a matter of weeks, begin setting that as your main intention. Tell all of your friends and family about your small goal so they can offer you advice or support along the way. Even working out for 30 minutes a day at three times a week can be a great path to begin completing your small goals, one step at a time. If you don’t make short term goals a part of your resolutions list, you can easily fall off the wagon. Burning out too quickly can be detrimental to completing your long-term fitness goals. Keep this tip in mind the next time you want to improve your fitness and stick to your resolution to get fit. Another great tip for setting goals that work is to have a goal buddy. If you want to change your diet to eat healthier food, try to eat out at a healthy restaurant after work with a close friend who has the same goal. When you develop a strong buddy system, you are more likely to take accountability for your actions. As they say, you are what you eat. You and your friend can talk to each other about cooking meals together to bring to work, too. If you want to lose weight, having a “diet buddy” is essential to the process. A diet buddy is someone who can work out with you on a regular basis which will further instill the importance of exercising. Working out by yourself can feel scary and having a friend to exercise with can decrease your nerves. When you surround yourself with good people who can support you, your goals can become a reality. If your plan for your specific goal involves driving far away and spending a lot of money, it’s likely that you are starting off in the wrong direction. Having a simple plan will encourage you to stick with it. You need to think about all of the obstacles that could impact finishing your goal, and be honest with yourself. Let’s say you want to join a new gym in January with a friend. Consider these questions: “Can I easily access the gym on a daily basis?” “How much will a gym membership cost per month?” “Is the gym close to my friend’s house, too?”. Once you figure out exactly how you are going to attack your plan, your life will become a lot less hectic. Plans really do help keep you in check. When you find time to go to the gym and carpool with your friend, your set schedule will provide you with reminders to continue focusing on achieving your goal. Most of the time we are our own worst critics. We spend so much time analyzing how we look that we lose track of what is most important, and that is having a healthy mind and body. However, if you are interested in a no pain solution to gain back body confidence, we offer nonsurgical lasers to reduce cellulite. When a goal is in the distant future, it’s easy to give up and stop. If you go to the gym once a day for two weeks and then stop going, you may think you have failed. This tip to believe in yourself also refers back to setting small, attainable goals. The slow and steady path is not a bad way to conquer your resolutions list! By pushing through the self-doubt, you can truly start to chase after your goals in a healthy way. Remember that every step of progress counts. Believing in yourself is one way to stick to your goals, but so is challenging yourself to take on more goals than you can handle at once. So, for this year, you want to have more money, lose weight, and quit smoking? Not so fast! Stick to one goal at a time, and you can actually achieve it when you make it your only priority. To set goals that work, ask yourself what goal you want to focus on first. Think about what goal can be the most attainable and start there. Putting one goal on your resolutions list to work at a time lets you plan out your method for completing it by the end of the year. Find a partner to help you work toward your goal. Create a simple plan to stick to. Believe in yourself so you don’t give up. Find one goal and stick with it for the entire year. Take on your resolutions list with a positive mindset. Of course, you may struggle to find your rhythm in the beginning, but don’t let your self-doubt stop you! Life is about the journey, so enjoy every part of it. And once you achieve your goals, don’t forget to come back and share your experience with us in the comments section below. This entry was posted in Fitness, Informational, News. Bookmark the permalink.